Every four years, the Idaho Commission on Aging (ICOA) submits Idaho’s Senior Services State Plan to the Administration for Community Living. This Plan not only ensures Older Americans Act (OAA) funding continues to be awarded to Idaho, but outlines the direction ICOA is taking over the next four years. The current Plan is in effect from October 1, 2016 through September 30, 2020 and identifies OAA and Idaho’s Senior Services Act services and supports available to help seniors and people with disabilities avoid institutionalization and remain as independent as possible in their homes and communities. 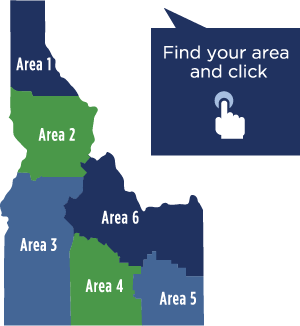 This Plan identifies how the federal and state funds are allocated to the six Area Agencies on Aging in Idaho, and identifies the planning efforts and data analysis that were used in its development. To find out more about the planning and coordination of senior services, we can use the area map below to find the nearest Area Agency on Aging. Also to the right, “Quick Tips” and “Resources” are available to better assist us with finding reliable information and supports.